Everybody seems to be interested in Daisuke Matsuzaka's pitching mechanics. 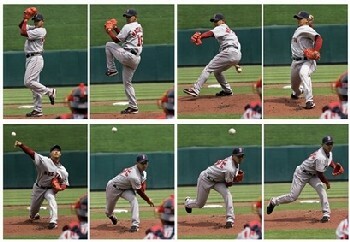 I recently found the sequence of photos below of Dice-K pitching that was shot from the front. I thought that people would be interested if I broke this sequence down frame by frame and that it would be interesting to compare it to the breakdown that I did previously of the pitching motion and mechanics of Daisuke Matsuzaka. This frame shows Daisuke Matsuzaka just starting his leg lift after planting his Pitching Arm Side (aka PAS) foot. In this frame, Daisuke Matsuzaka is at the top of his leg lift and is just about to start striding toward the plate. Notice that his hips are significantly reverse-rotated, but his shoulders are not as reverse-rotated. This frame shows Daisuke Matsuzaka just after breaking his hands. Notice how he is taking the ball back toward 2B and has dropped his PAS hand back by his PAS pocket. This will help to hide the ball from the batter, which is one thing that helps to make a pitcher sneaky fast. His Glove Side (aka GS) foot is sweeping out toward 3B as he strides and he is leading his stride with the heel and side of his GS foot. I call this striding sideways to the target. Dice-K is pointing his glove just to the 3B side of the plate. This frame shows Daisuke Matsuzaka in what some call the Power Position. His GS foot has just planted and his shoulders are just starting to rotate. His hips are fairly open (45 to 60 degrees) while his shoulders are still closed. He is still hiding the ball from the batter. He landed with his GS foot pretty much in line with Home Plate but with his GS toe pointing just slightly to the 3B side of Home Plate. This frame shows Daisuke Matsuzaka just after the Release Point. You can see that Dice-K throws from a 3/4 arm slot. His glove is in the vicinity of his GS pec. His PAS foot is still on the ground. In this frame, Daisuke Matsuzaka's PAS foot has just come up off the ground as his hips have continued to turn. In this frame, Daisuke Matsuzaka's arm has pretty much decelerated. His PAS foot has kept coming forward which helps his hips to keep turning which helps his arm to smoothly decelerate. One thing to notice is that Dice-K never locks his GS knee. Some people think this is important to throwing at high velocity. It's pictures like these that make me question that notion. The thing that strikes me in this frame is that Daisuke Matsuzaka finishes in a solid fielding position. He is square to the batter, his eyes are locked on the target, and his glove is near his GS pec. This will help him field his position better than average (and help to protect him from come-backers).